Did you know you can cook with your garden weeds? 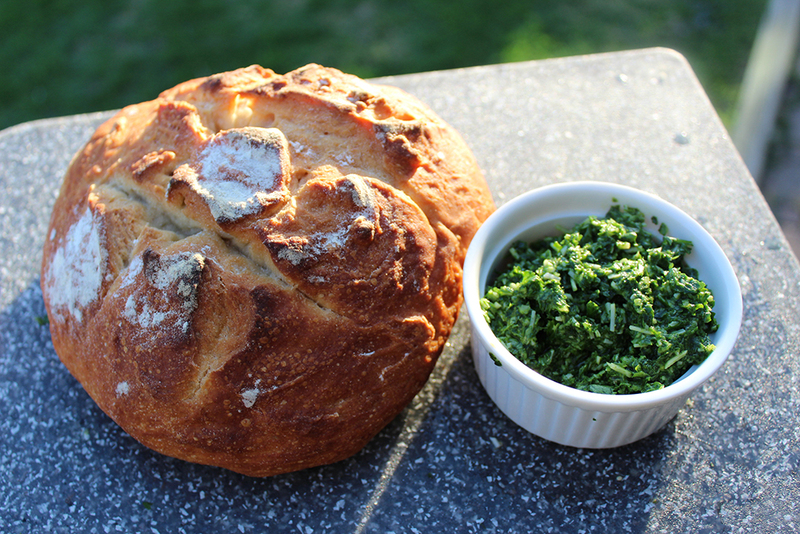 Chickweed Pesto and homemade sourdough bread. Chicory is nearly indistinguishable from dandelion plants until June, when it sends up a long stem of pale blue flowers. In contrast, chickweed is a small plant that is tastiest in early spring or late fall but grows year-round with small white flowers. Jules Erwin, a Boy Scouts Hoosier Trails Council district executive, prefers chicory as a potential food source and wild edible. She says it is more aesthetically pleasing than some of the other wild edible plants, and has been used as a coffee substitute since the Civil War. Chicory and chickweed may be tasty plants, but they are missing from local grocery stores. Chances are better that they could be found at a farmer’s market or herb garden, but Erwin recommends collecting your own. Erwin says Newcomb’s Wildflower Guide is the easiest to use. She warns that internet content might not be professional, and prone to errors. Even so, as long as it connects you with the landscape, it will make you feel better and more inclined to preserve natural places. Erwin encourages everyone to try identifying plants, even to the point of annoying their friends. She says when she goes hiking with friends she likes to stop and look at plants, ignoring her friends when they get exasperated with her. Though chicory is not native to Indiana, it is now found through out the state. Erwin also recommends giving chickweed a try. Chickweed is not a terribly attractive plant, not that it matters much though as most recipes for chickweed involve grinding it into a paste for pesto or dip, as in the recipe below. Place all ingredients in blender/food processor and blend well. Spread on sandwich or use for your favorite pesto dishes.